Discover Split and Dubrovnik on the beautiful Dalmatian Coast and neighboring Kotor, Montenegro, a medieval city tucked against cliffs at the end of a stunning fjord. While in Croatia, visit the Diocletian Palace or dig for oysters in Ston, a small, magnificent fortified city known for its oyster farms. Cross the sea to Puglia, Italy, where you can visit Alberobello’s distinctive “trulli,” whitewashed homes with cone-shaped roofs that could be straight out of a fairy tale. 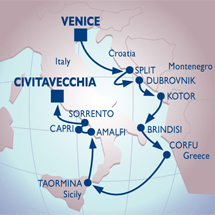 You’ll also visit Corfu and Sicily before heading to the pleasures of the Amalfi Coast. Two overnights and four late night stays allow plenty of time to relax and dine under the stars.